Feature to expand a great number of stock quotes into multiple charts. Z-score to allow price triggers along with MACD, RSI and 52 week high/low. Distribution reduction analysis to help determine worst case stock dividend decline. The basic function of the Portfolio Online Tracker "POT" was developed to monitor a list of stock prices during the day when the market is open. It takes this step further by visually displaying all stocks percentage change on a single bar chart. This allows the user to instantly compare each holding against each other in real-time, see Figure-1. The application is designed to monitor an already selected list of stocks by the investor and not for the purpose of stock selection. It is assumed the investor has already performed due-diligence on their stocks. This article provides an update to the downloadable link "Recreational POT (Portfolio Online Tracker)," which can be used by most DGI and HYI users. I have designed the Excel application to download quotes during the day with a single push of a button. The application also gets a years’ worth of pricing data when the application first opens. With price data, quite a few individual technical parameters can be calculated and help in acquiring new shares during market volatility. I have written a previous article outlining in detail the following technical analysis parameters: RSI, MACD, High/low 52 week, 50 dma, 200 dma. Along with the previous technical parameters and the new Z-score it’s possible to monitor each parameter for a trigger point represented by a star; Example “******” to indicate all trigger levels have given a possible buy event. I used this star trigger extensively during the last 3 months of 2018 and improved my projected future income growth. A total of 8 application notes describe different functions in the tracker. The downloadable zip file linked above contains all eight word documents along with the actual POT Excel application. Application Notes are listed below along with the three new features. “AN-0 POT5.n_Getting Started”; Provides an overview of control buttons, cells and charts. Included is a feature to save and retrieve a portfolio; good for future POT updates. “AN-1 POT5.n_Enter Your Own Symbols”; gives instructions to enter your own stocks. “AN-2 POT5.n_Fear VIX Correction Bear Alerts”; the tracker will alert the user of high VIX values (fear index) along with S&P500 correction or bear markets. “AN-3 POT5.n_Historic Dividends”; provides historic dividends from 2 to 25 years loaded in a separate worksheet according to ex-dividend date. A table is generated to tabulate dividends for each year. I use this feature to get historic dividend trends for stocks in my portfolio, I have written an article that demonstrates how to use this application. “AN-4 POT5.n_Compound Growth Calculator”; growth calculator is to study either a DGI or HYI strategy; enter current balance, yield, growth rate, distribution, inflation and year you want to retire. I built this when I was still working to get a sense of income and balance when I retired. NEW: “AN-5 POT5.5_Quote Display Change”; the first of three updates to POT allows the expansion of your holdings into two separate charts to allow easy reading of notes above the stock bar. In some instances perhaps greater than 80 stocks the notes above the stock symbol become unreadable. There is now a “1st half” and “2nd half” chart to display daily percent changes along with price and yield, see section;“Chart Display split holdings”. NEW: “AN-6 POT5.5_Price Z-score buy-flag”; the second update now calculates the Z-score from a years’ worth of price data. The Z-score tells us how far away the daily price quote is from the yearly price mean (average). Using the Z-score also creates a way to normalize price based on standard deviation between stocks. If the Z-score is 0 then the current price is equal to the mean. If the Z-score is -1 then the current price is one standard deviation lower than the mean; 34.1% below the mean price. If the Z-score is +1 then the current price is one standard deviation higher than the mean; 34.1% above the mean price. Basically it is a way to provide a real-time method in determining overvalued and undervalued daily price movements, see section;“Z-score for price entry points”. NEW: “AN-7 POT5.5_Dividend Risk Analysis”; the third update alleviates the uncertainty of providing a distribution in retirement. This has always been in the back of my mind when building my portfolio and declaring a distribution between 50 to 60% of the total income in retirement. The question has always been how many of my high-yield stocks are going to zero before there is an interruption in my distribution? I can now answer this question: see section “Dividend Risk Analysis”. The portfolio tracker can display many stocks exceeding the bandwidth of information above the quote bar for each stock. Along with the basic daily price percentage change is the note above the daily percentage gain/loss bar. It now includes both yield and price. You can display charts for the first and second half of your stocks. See below screen samples. When updating stock quotes the following chart display will be shown. Now press the “1st Half” button and the following display will be shown. Now press the “2nd Half” button and the following display will be shown. This feature makes the note above the green bar more readable when the portfolio contains many stock quotes. Press the button one more time and the full screen in Figure-1 is displayed again. The diagram in Figure-4 demonstrates a normal distribution of data values. They can represent any dataset sorted from minimum to maximum. For the Z-score calculation I use one year's worth of price data. The percentage in Figure-4 is a range based on the data set of price for each individual stock. 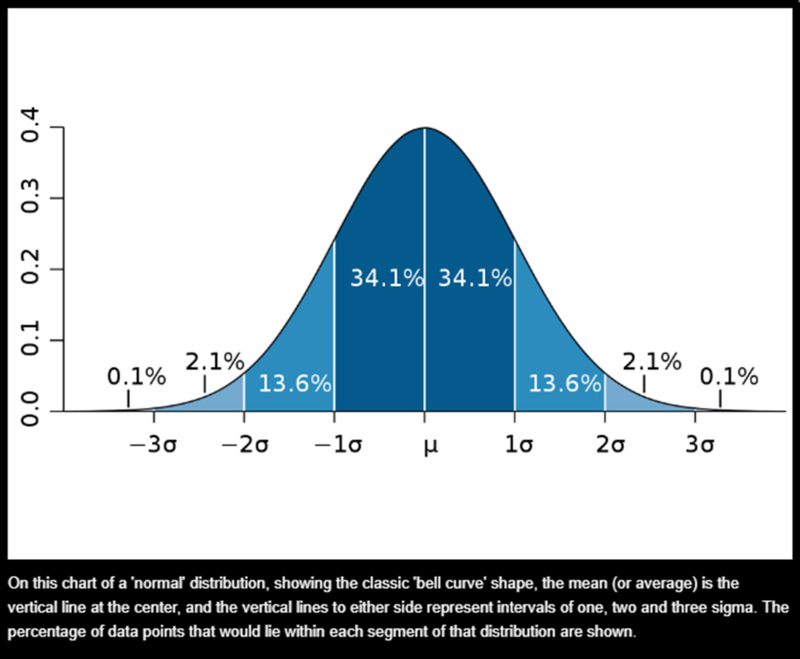 To interpret a normal distribution in Figure-4 the stock’s price will remain in the blue shaded area 68.2% of the time within one standard deviation. Visually you can see that when the Z-score becomes more negative, the price is entering an extreme undervalued condition. It must be noted the data representing price is not an absolute normal distribution, because price is very volatile. We can still use price representing a normal distribution that allows comparative results with other stocks. A single daily stock quote gives a good indication where price fits on the bell curve range. When looking at the bell curve Figure-4 diagram, the center value is the price mean. The calculated Z-score can vary above and below the mean to tell us how far away from the mean price has moved when running a quote. For my trigger point I use negative 1 to trigger an alert telling me the price has deviated from the mean. The larger the negative value, the greater the chances for a possible purchase after examining the rest of the technical parameters. The portfolio tracker has many features and Figure-5 is one sample of a text display I use to determine which stocks come into my purchase zone. The display above indicates a possible valid purchase trigger event for stock TCG BDC Inc. (CGBD). Column 15 (col-15) shows a 5 star trigger event according to the technical analysis positioning from col-9 to col-14. I choose this method for triggering an event, because I did not want to look at numbers all day and try to interpret them for each holding; this is why they invented computers. I let the software quickly tell me if any stock is worthy of my consideration in a matter of seconds. The Z-score takes a year's worth of quotes for each stock and calculates the mean and standard deviation. The Z-score is in real time with each stock quote update. What the circled blue Z-score col-14 says about CGBD stock is price has declined 2.78 standard deviations from the mean. So when the Z-score is greater than negative 1 the star “-----*” flag in the sixth position is filled. If you look at the “RSI<30” col-9 (first blue box) notice the value is -10.63 for CGBD. I have an offset for RSI set at 30 and any number negative represents an RSI below 30 and a possible buy flag. In this case having an offset of 30 the real RSI value for CGBD is sitting at 19.37, (30 minus 10.63). Any negative value in col-9 will trigger a star flag in col-15 at the first position. Looking at col-11 (second blue box) highlights that most stocks are near or at their 50 week low. Looking at col-14 (third blue box) indicates the Z-score is very negative for the first six stocks. Figure-6 actually shows two different lists at the same time. The first list of stocks I need to increase my income allocation; notice the share counts for CGBD, PennantPark Floating Rate Capital (PFLT), Golub Capital BDC Inc. (GBDC), Solar Senior Capital (SUNS) and Goldman Sachs BDC Inc. (GSBD). The following Table-1 is a list of holdings taken February 22nd 2019. Price has recovered quite a bit since last year making any purchases very difficult. A wait and see action is planned to provide better entry points. On December 13th 2018 Figure-6, CGBD had a Z-score at negative 3.4 and on February 22nd of this year the Z-score is under negative one, no trigger. Notice in Table-1 the “RSI<30” column value for CGBD is at 33.13. For the actual RSI 33.13 needs to be added to 30 for a value of 63.13 well above the purchase zone. We are far away from any type of purchase area according to the RSI value. The only two Z-scores below negative one are Two Harbors Investment Corp. (TWO) and AGNC Investment Corp. (AGNC), the rest of the technical parameters for both stocks was triggered except for RSI and MACD. Good quick information at your fingertips in seconds. What is interesting is the bottom of the table showing 5 stocks hitting a 52 week high along with very positive Z-scores. All five Ladder Capital Corp Class A (LADR), Ares Commercial Real Estate Corp. (ACRE), Fidus Investment Corporation (FDUS), Hercules Capital Inc. (HTGC) and Stellus Capital Investment Corp. (SCM) prices are above their 50 and 200 day moving averages. If someone purchased them last year and are traders they could sell for a profit, but this action is against my investment strategy, so I take no action. The only concern a retired income investor has is the stability of the distribution. I have wanted to find out for a long time how my portfolio would stand up to dividend reductions or eliminations. The worst case analysis would take the highest paying stocks and begin to eliminate their dividends to see what is left to provide a stable distribution. This application will answer this question and give me confidence in its ability to maintain the distribution. It can be applied to any DGI or HYI portfolio. The distribution is calculated by taking the distribution percent of total yearly income, about 59.2% (my current percent) and multiple by the total portfolio income $51,976 equals $30,770. The analysis will use this number as a minimum distribution value and begin to subtract stock dividends. The complete analysis is setting each stock dividend to zero and seeing where the cutoff allows the needed distribution dollar amount. As seen in Table-2 there are 11 of my highest income producers (“Cur-Income” column) eliminated with a declining-value of $20,338, see column “AtRisk-Inc” for each stock set to zero. The distribution is untouched at $31,638. The verbiage "Sleep Well At Night" is a no brainer with my current high yield income generator. The Portfolio Online Tracker application has been updated over time from when I was employed and now retired. I constantly come up with new ways to evaluate my actual portfolio and implement any new applications into the portfolio tracker. I make this tracker available to all SA members, not to make stock selections but to just monitor their holdings in a quick and convenient way. I currently use Recreational POT every day and along with the charts keep me informed of my holdings. If you want to be informed of any new future updates, please click the follow button at the top of this article. Disclaimer: I am not a financial adviser, but an independent investor. Please note the stocks included in the 50/50 portfolio are not recommendations. They were personally selected by the author and contain a great deal of investment risk. The stocks in the portfolio are BDCs and mREITs. Both investment vehicles are " Regulated Investment Companies" and required to distribute at least 90 percent of their earnings as dividends to investors. This is a live active IRA portfolio that I believe will withstand the markets' bull or bear cycles based on my own research. The progress will be updated and tracked for feasibility of this investment method over the years. The article titled 50/50 Portfolio (BDCs And mREITs) Baseline 2014 details how the portfolio was constructed. It must be noted that investment selections are dynamic and based on management's ability to navigate economic conditions. I have made changes during the years as any portfolio manager is expected to perform. Disclosure: I am/we are long ALL STOCKS IN THIS ARTICLE. I wrote this article myself, and it expresses my own opinions. I am not receiving compensation for it (other than from Seeking Alpha). I have no business relationship with any company whose stock is mentioned in this article.